I know I am a day late in posting this for the Summer Crush theme last week, but I had some family things to take care of yesterday that prevented me from finishing everything up. Not to worry, everyone is doing good now. Eric and I just had to attend to several different family members yesterday all for different issues. It was a busy weekend for us, which culminated with me having jury duty today. Luckily, I didn’t get picked, because I don’t think I could handle the case that was being presented. I still want to share the garment I made for Summer Crush though. Here it is, better late than never. 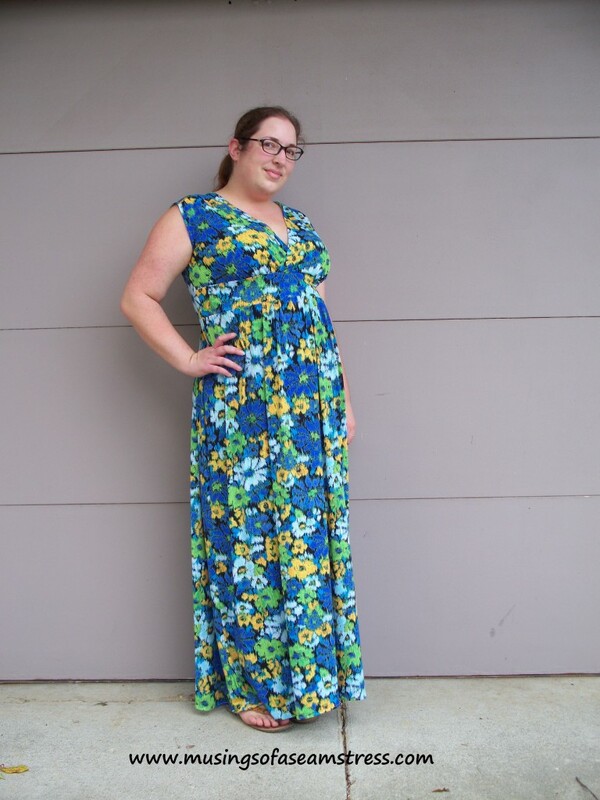 On Saturday, I mentioned my summer crush this year is the maxi dress. Here is the newest one I have made. Another version of McCall’s 6073! Big surprise, right?! This is my third version of this pattern this year and I am not even close to sick of it. 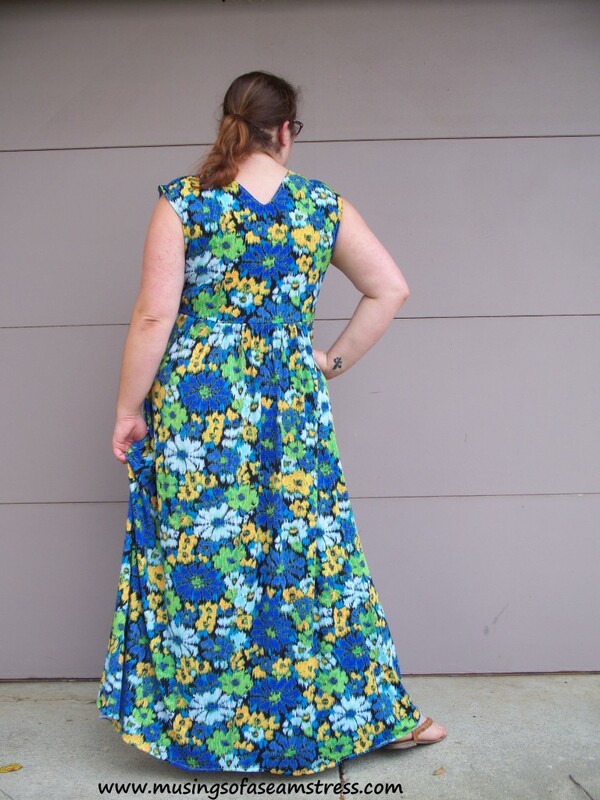 The pattern is so flattering to my body type that most of my dresses are this type of style. The belt does a great job of accentuating my midsection, while the crossover shows off my curves well. The overall length of the bodice hits me in a great spot so the skirt makes me look taller. The gathers of the skirt help to hide my tummy too. This version is a whole lot of floral! I love the print of this ITY Knit and I also have it in a purple colorway. Both of these were purchased from my job way back in June at $1.12 a yard. I also added an underlining to the bodice of white swimwear lining for to help support the weight of the skirt. 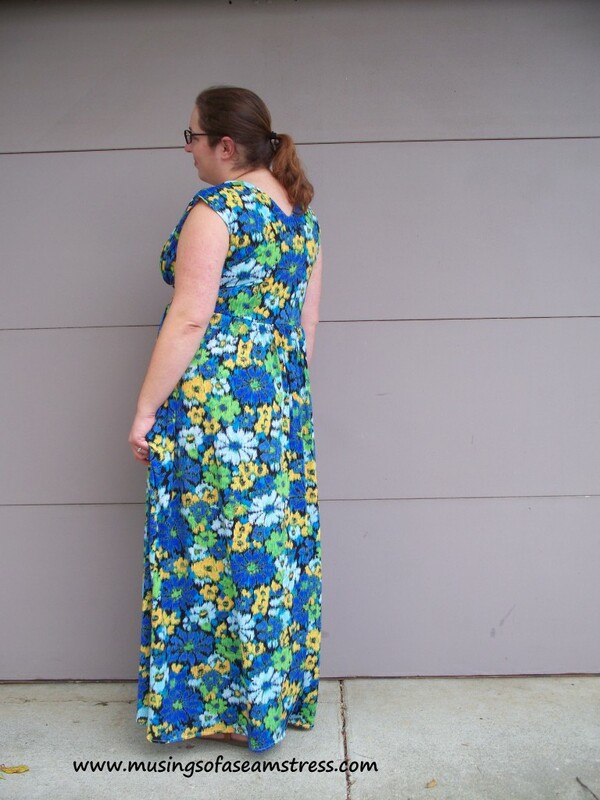 I used 3.25 yards of the ITY and .75 yards of the swimwear lining for a total cost of $8.24. Not too bad! Not bad at all! I did make a couple of minor alterations to this version. First, I took the crossover at the belt down by about 1″ to eliminate some of the gaping open at the chest. This didn’t quite do the trick so I took the shoulders up in the front only by 1.5″ and now it is perfect. There is no gaping open and it fits nicely around my curves. This weeks theme is Never Ending Summer, where we are sewing garments that keep us in a summer state of mind all year round. I have one garment ready but am not contemplating making a second. 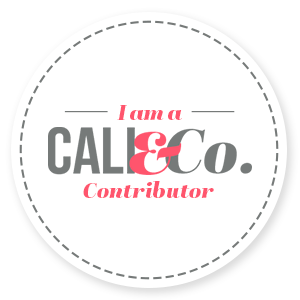 Head on over to Melissa’s blog to read more about this week’s theme and join the linky party! 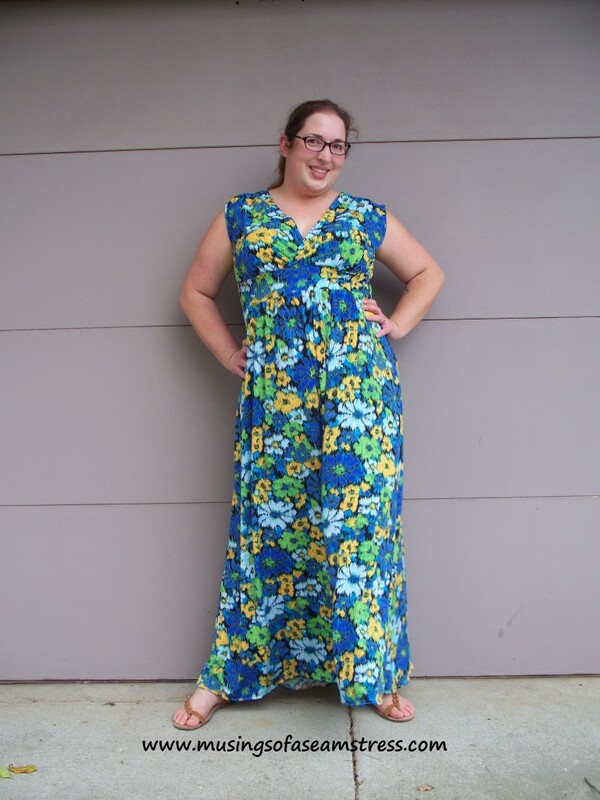 This entry was posted in Sewing and tagged #sewlongsummer15, floral, ITY knit, maxi dress, sew long summer, summer crush. Bookmark the permalink. I’m in love with this dress! 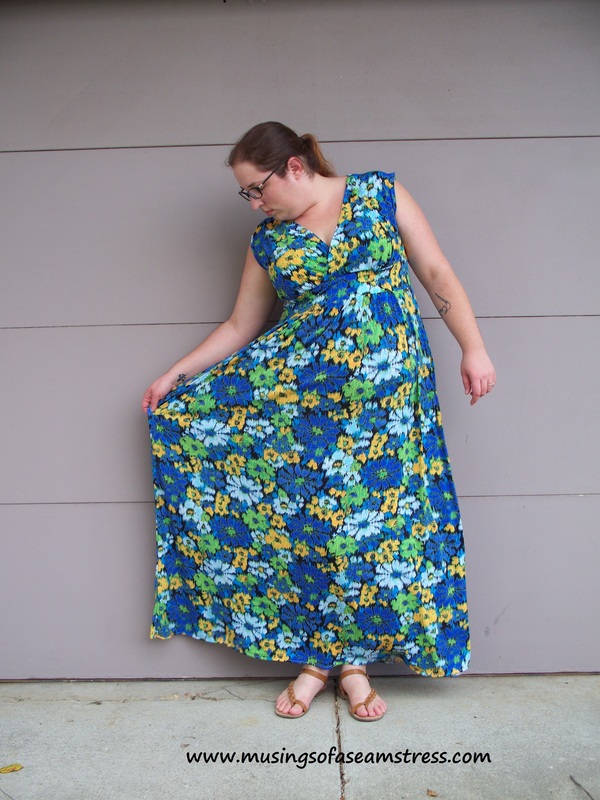 The pattern and the fabric are too pretty on you! Gorgeous print. And what a great price! I’m glad you didn’t get picked for jury duty. That’s the worst. Thanks! I am so glad I didn’t get picked either! I need some help on this back v neckline. I’m sure hoping that you can help me out. The instructions are not clear and I’m quite confused on how this back v goes together. Any help from you would be greatly appreciated. Sure. I did not follow the directions for this. I skipped the binding on all the versions I have made because of the prints I was using. I didn’t want the binding to stick out from the rest of the bodice. Instead, I just turned and stitched one version. For this blue floral version, I added a lining because the fabric was so thin. I recommend adding a lining. To do so I stitched the shell to the lining, face to face. I clipped along the curves and as close to the stitching on the center back V. I then turned it right side out and topstitched a 1/4″ from the edge. Thank you so much! The instructions for this were driving me crazy, I think Ivan work with this thanks to you. Sometimes having another suggestion is all that I need! Thanks again.